My first meeting with Opera's Small screen rendering browser was experienced from a desktop PC. With the new PC version of the browser you can choose to view ordinary web pages the way they are presented on a Sony Ericsson P800. With the "Small screen" settings on, the layout of a web page looks almost as it does on the P800. Some of the background images in tables are visible in the PC version, but not on the P800. One of the first things I wanted to check out was how the browser handles frames. I had some difficulties finding web sites that use them. Luckily, most web sites created today have abandoned frames design. The site I could immediately recall was Ask Jeeves www.ask.com. By clicking on a link on the Ask.com search result page, you open up a page with an Ask banner on top, some links in the middle frame, and the search result page in the bottom frame. In the browser settings, you can decide if you want the frame pages show the usual way or only list them as links. I found the standard settings fine. Something you probably don't think much about when browsing Internet from you PC, is the GPRS cost and time spent online. Many users are now connected to the net via Cable/DSL or a faster connection. But when you are using mobile devices to browse the net, you only have two choices. GPRS (pay per data downloaded) or dial-up connection/HSCSD where tariff is based on time used online. I wanted to check what the CNN web page looked like on the P800. The CNN front page is 52KB large, but when adding the 31 images, the total amount downloaded summed up to 183KB. With my GPRS price plan, this would have cost me over USD $2. Using dial-up the cost went down to $0,2. Even if large images are displayed within the margins of the P800 screen, the original image is nevertheless downloaded before it is resized. Just like the PC version of Opera, you may choose to open new URL's or links in a new window. This is the way I am used to browse from the desktop PC. It is especially useful when you are behind a slow connection. When using the Opera on a mobile device, you will probably connect to Internet using a dial-up connection and not GPRS. The option to download several pages in a row before you start reading them is very nice. Maybe you will click on an interesting link and start the download of the next page while you continue to read on the current page. Opera's ability to open links and new URL's in a new "window" is one of the most useful features I liked with the browser. It's fast and easy to switch between the pages/windows. When you have downloaded a page, you can switch forth and back between the original page layout or the "small screen rendering" layout. The Opera browser shrink images and change the layout on the page to fit the P800 display size. Common 468x60 banners are shrunken down to less than half the original size, so you won't be able to read the message on all these advertising banners. The browser also has a built-in FTP client. You can download from FTP sites both with anonymous access, and password protected servers. Too bad there is no way to upload files to a FTP server. This could be a useful feature for upload of pictures taken with the built-in camera. The Sony Ericsson P800 does have a built in browser, and you can also install a third-party Java browser from ReqWireless. But none of these two browsers can match the Opera when it comes to web pages. The Opera WAP browser renders WAP pages the exact same way as the PC version. After browsing 12-13 pages with cache size set to large. According to one of our observant readers, the Symbian OS memory manager closes down applications running in the background when there is too little ram left in the device. Anyway, I have on several occasions experienced that I not could start an application because of too little memory. An example of this is a dialog box saying: "Not enough memory to launch application. 3584 KB required". Closing Opera (or other running applications) solves this problem. I don't know under which criteria the browser clears the cache (previous accessed pages/images). It could be that it starts deleting the oldest content when the cache gets filled up, or when then phone runs out of memory. I experienced no problems browsing web pages, except for some images that didn't want to download. Since it is possible to browse the net with the P800 in the sync station I did a check on the pages where this happened. And I found no problems with the images there. This could indicate that there was something wrong with the net connection and not the browser itself. By tapping on the time indicator on the built-in browser while a page is loading, you switch between showing the time used and KB downloaded for the active page. The indicator on the Opera browser does not work so well. You see how many kilobytes you have downloaded, and how many images vs total number of images is downloaded. But the indicator often stopped at 1KB. Again, this could depend on the dial-up connection and not the browser. The Opera browser does support plug-ins, but I didn't find any web pages that made the browser ask for a plug-in. I guess the Opera browser works the same way Netscape did in the past, and asked you if you wanted to download the required plug-in. So how does the content of a regular web page fit into the small 200 pixels wide P800 display? Opera does this by shrinking down some images, and by removing some of them. I don't know the criteria for which images to remove and which it show, but it seems to work well. The browser also remove background colours and change unreadable text colour. The images below is taken from the slashdot.org web site. As you can see on the P800, the images for the lock, motherboard, palm and foot are all removed on the P800. But the US flag is visible. The browser has obviously replased the image with the ALT-tag describing the images. slashdot.org in a web browser. 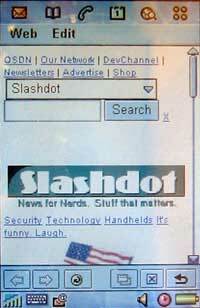 slashdot.org on a P800. Notice how the lock, motherboard, palm images are replaced by the image description. Most modern browsers support compression of web pages. So does the Opera browser. But not many web sites compress the text content before it's sent to the client. When a browser sends a request for a page, it can include a hidden string that tell the server to compress the page before it sends back the page. An example is the Esato front page. Older browsers, browsers behind a proxy or personal firewalls remove, or don't send the hidden string "ACCEPT_ENCODING: gzip". If they don't, the Esato server returns the page uncompressed. But Opera do send this string and the Esato server compress the page from 23987 bytes down to 6369 bytes before it sends the page back to the browser. This will of course have a huge impact on your browsing experience and wallet. The Opera browser for Symbian OS v7.0 is a good deal. Even if it wasn't for free. It has the same features as the built-in browser shipped with the first batch of P800's. Plus some goodies. It's not possible to un-install the built-in browser, but Sony Ericsson may substitute the current browser in new shipments of the P800. Small screen rendering. Present ordinary web pages into a 208x300 pixel display area. The Opera browser will be available for free download from the Sony Ericsson web site on Monday, February 17th. Visit www.sonyericsson.com for more information.